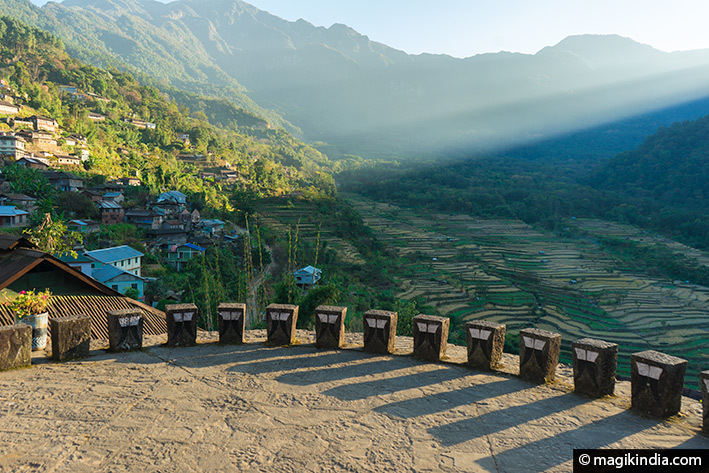 Perched on a rocky spur 1200m above sea level and 20km from the capital Kohima, the village of Khonoma with its discreet inhabitants and its unspoilt environment will charm the traveler in quest of peace and authenticity. The village of 3400 inhabitants and over 500 years old, takes its name from the local aromatic plant known as “Khwüno”. The ancestors thus baptized the village “Khwünomia”, ie the inhabitants of the place where the Khwüno grows. During the British colonization, for practical reasons of language, it was renamed Khonoma. Khonoma was for a long time the stronghold of the Angamese ‘head-cutters’ warriors who resisted until 1880 against the British invader. Famous leaders of the “Naga National Movement” were born here as A.Z. Phizo. 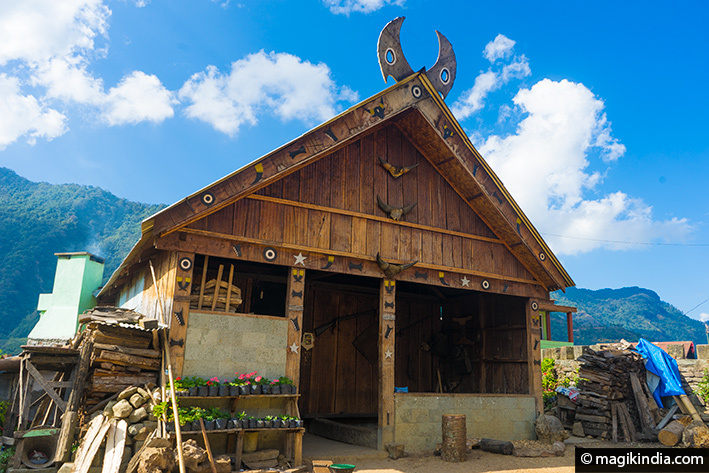 The village is inhabited by the community of the Nagas Angami whose language is of Tibeto-Burman type. 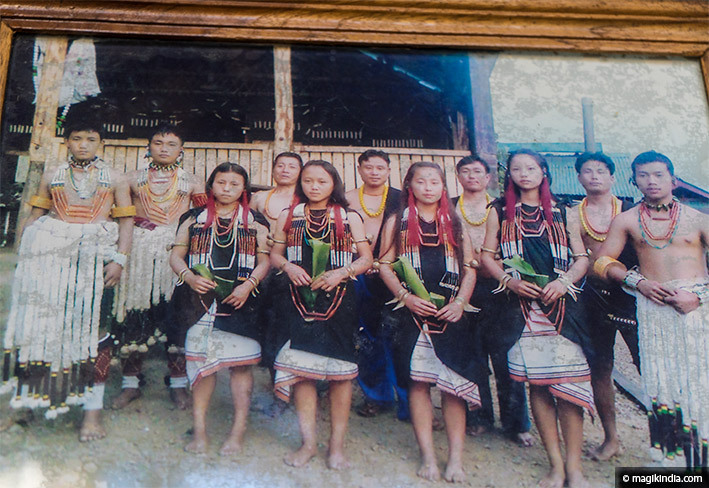 The Nagas Angami live generally in the mountainous regions of Nagaland depending mainly on farming. 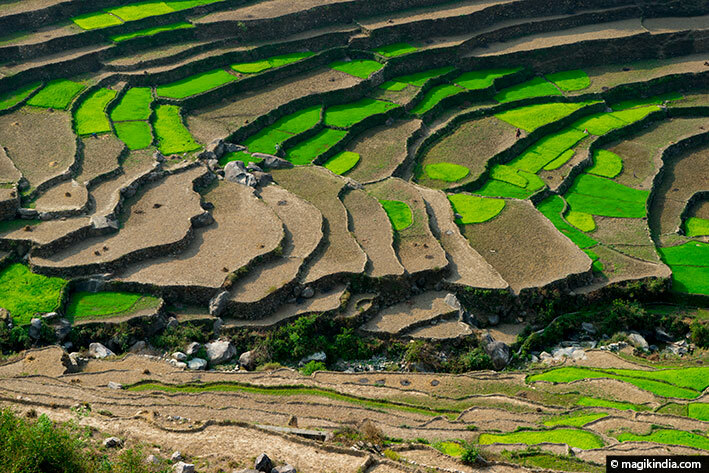 They are notably known for the cultivation of terraced rice such as of Khonoma which is one of the oldest in the region. The Angamis were head-cutters warriors. They spent much of their time fighting against hostile villages. As a symbol of their power, they were cutting off the heads of their enemies. In 1896, when the British annexed their territory, inter-village quarrels gradually ended. 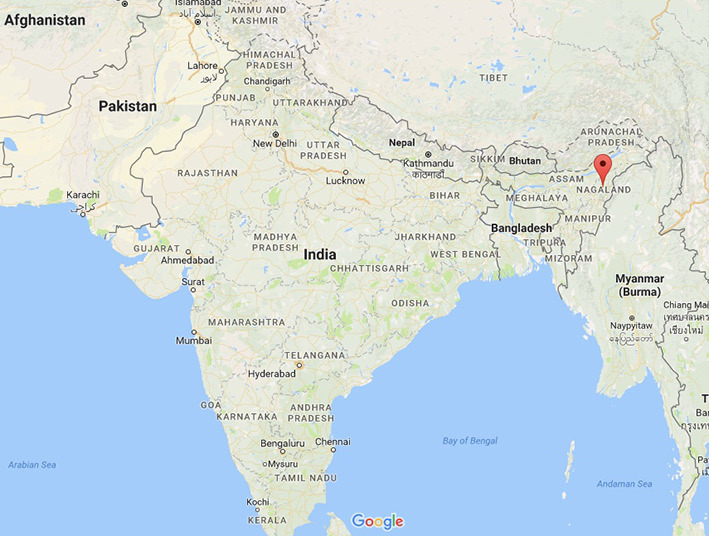 British brought Christianity and a vast conversion of the population took place in all Nagaland. 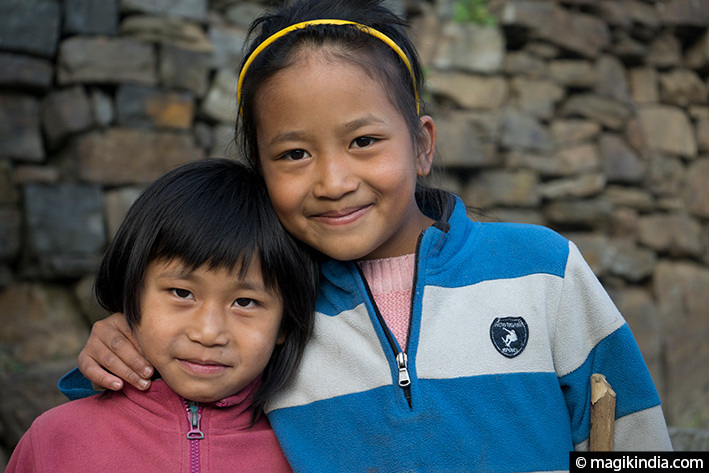 Nowadays, 90% of the population of Nagaland is Catholic, only a handful of Nagas have kept their animist traditions. 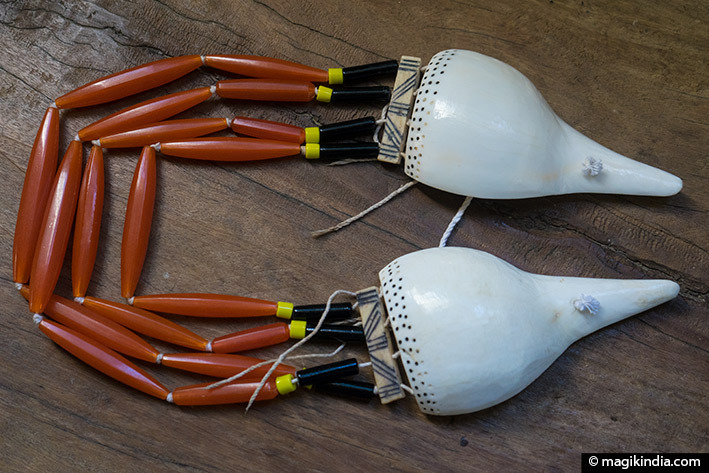 The traditional Naga Angami necklace made of conch, glass, carnelian and bone. Khonoma is traditionnally a village of hunters. 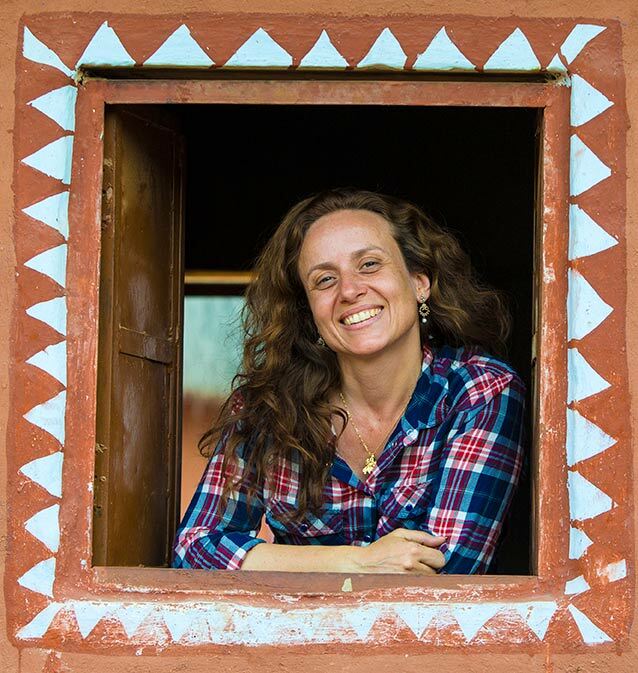 It has chosen, however, ecological development, establishing systems for managing natural resources and resolving conflicts between villagers, all that with a determined will to conserve biodiversity and wildlife. 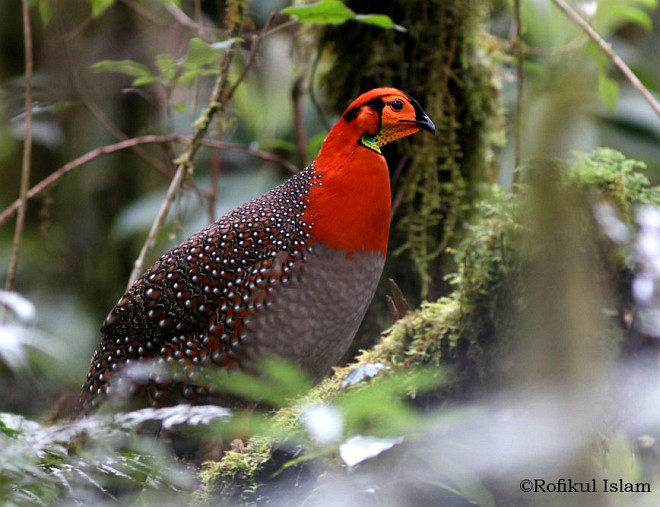 In 1998, the village council of Khonoma declared its intention to create a 2000-hectare nature reserve known as the “Khonoma Nature Conservation and Tragopan Sanctuary”(KNCTS). KNCTS has now become a privileged area for the observation of birds such as the Blyth tragopan, the mountain bamboo partridge or the crested Finchbill to name but a few. 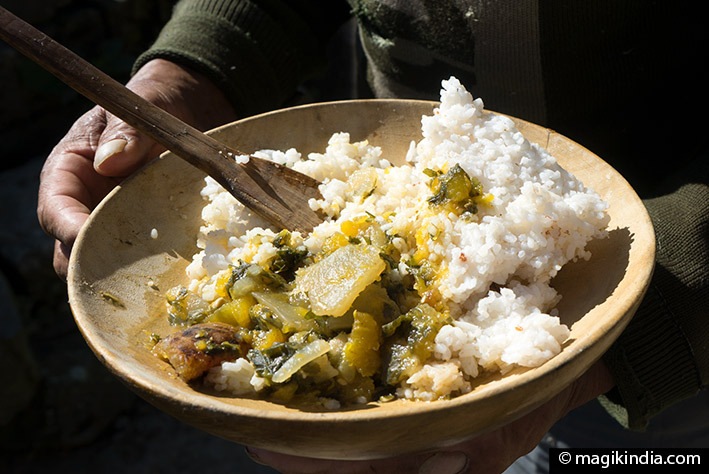 Khonoma is in organic farming; The meals taken in your guesthouse are of an incomparable freshness and taste and they are the best examples of this preserved nature. 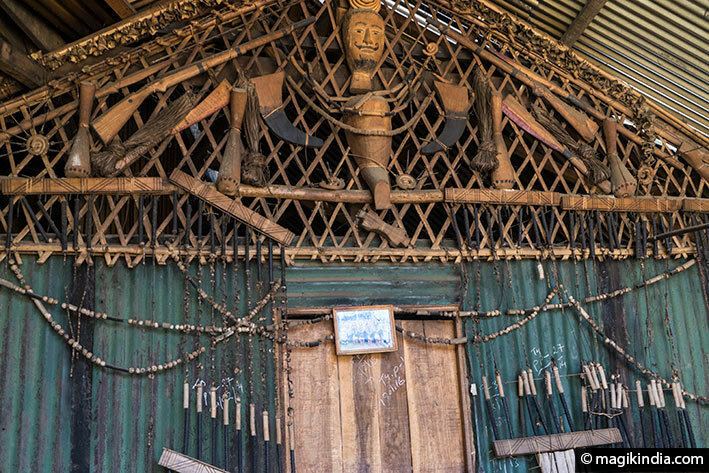 In the village, you will come across the famous ‘morungs’ (boys dormitories) a kind of chalet with swords on the top ; They are places of education for the boys of the village. Those richly decorated wooden houses are built on the same model; Outside, benches are placed around a fire and inside, a long common bed of about 15 places is carved in a single trunk. In these morungs, the duty of the ancients is to inculcate moral values, social responsibilities, craftsmanship (see below), agriculture, various sports such as wrestling and folkloric traditions such as songs and native games. As modern life gradually enters the village, this tradition of morungs, although less followed, still finds its place. 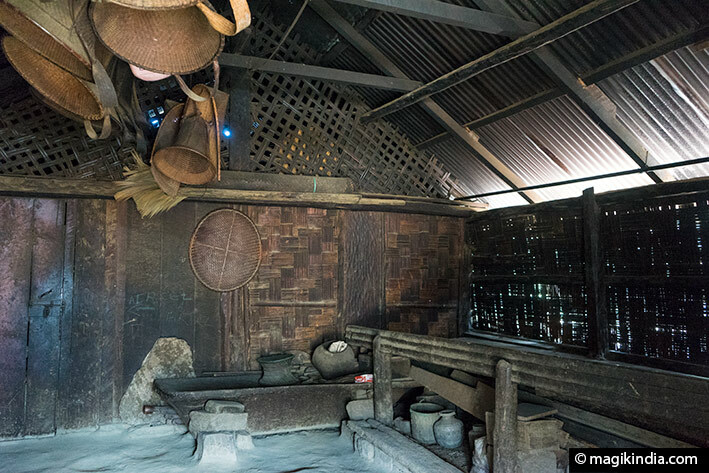 Khonoma is the home of many master craftsmen in the field of basketry and weaving. 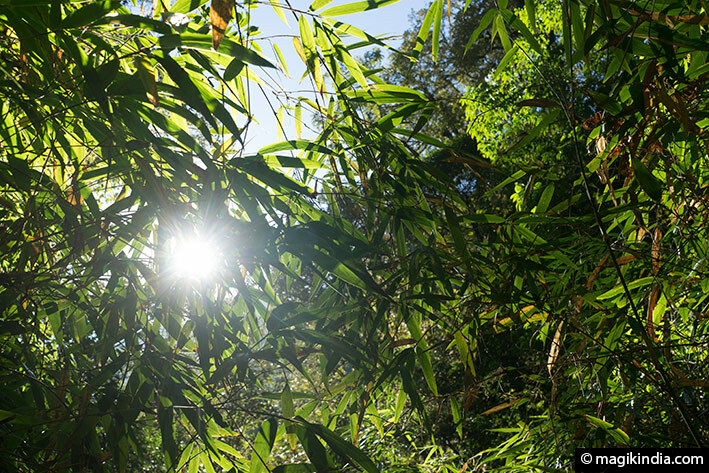 The forests of Nagaland are rich in bamboo and cane. Thus, the art of basket making amongst the Nagas is very developed. 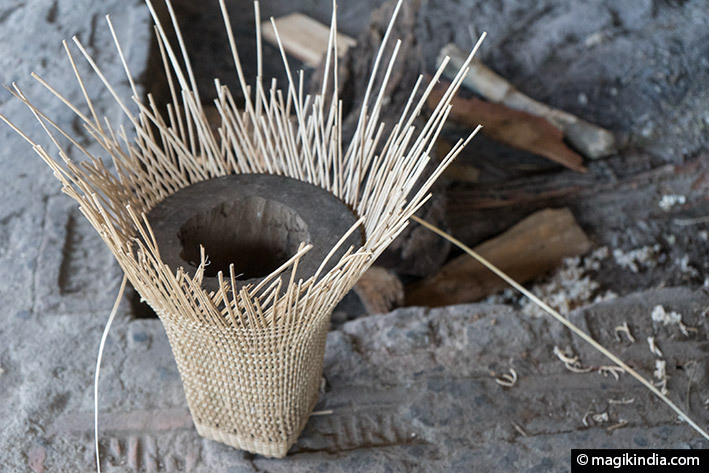 The very characteristic basket of the Angamis, called khophi, is made by men only. It is a bell-shaped basket with a square base and four feet. He also has a braided head strap that the women adjust on their forehead. 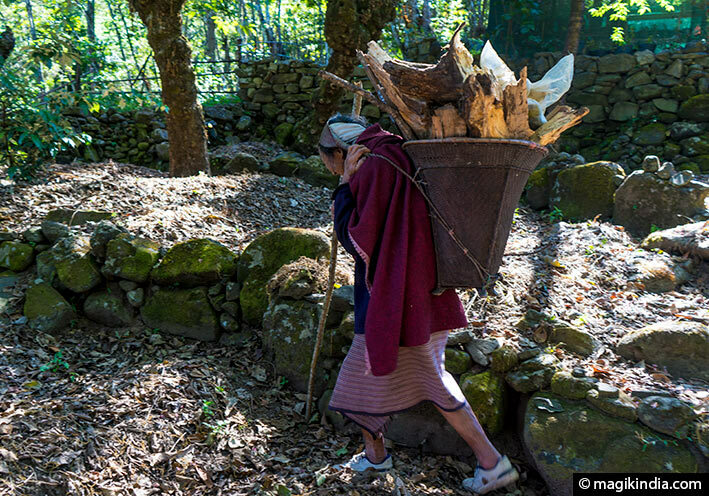 Women lift them to pick up wood, or to carry harvests like rice and vegetables. 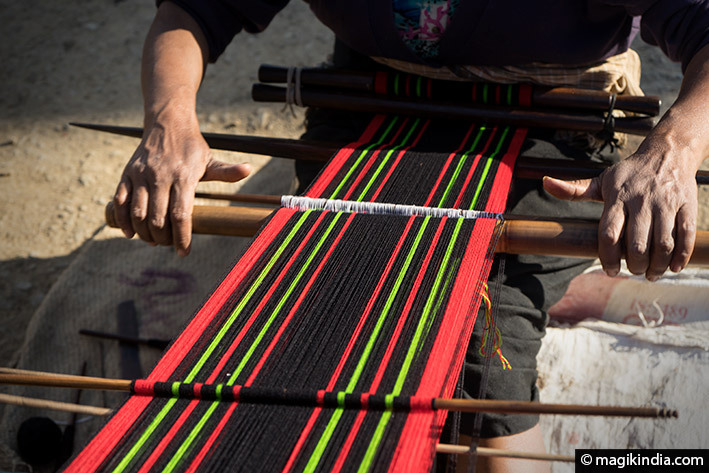 The other traditional craft of Khonoma is weaving. 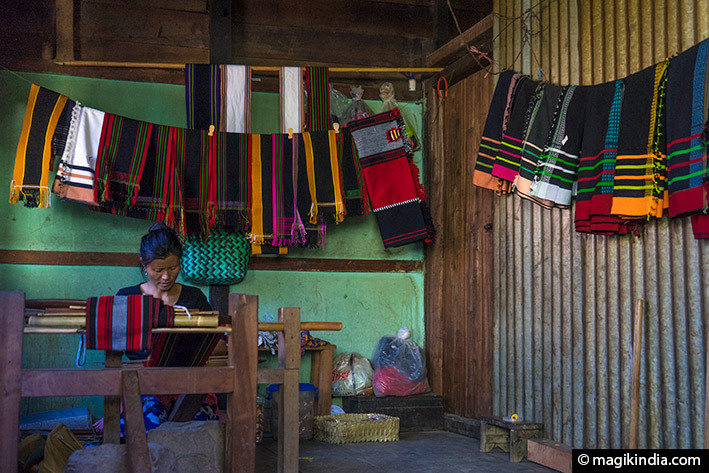 The Angami women are expert weavers. The predominant model is the ‘Loramhoushu’, a fine wool shawl with white, red and black stripes and the lohe with black, red and green stripes. 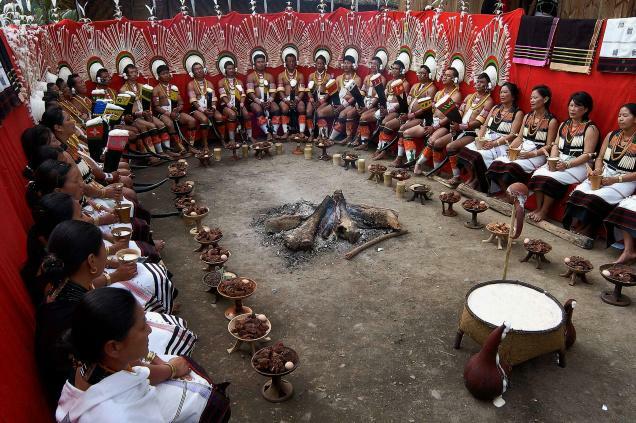 The traditional Naga cuisine is non-vegetarian and uses a large number of fermented products (up to 150 types) made from bamboo shoots, fish, mustard leaves, etc. The most consumed fermented food however is ‘zutho’ or rice beer. As you walk through the cobbled alleys of Khonoma, it is very common to meet villagers enjoying the zutho with their family or with their friends. 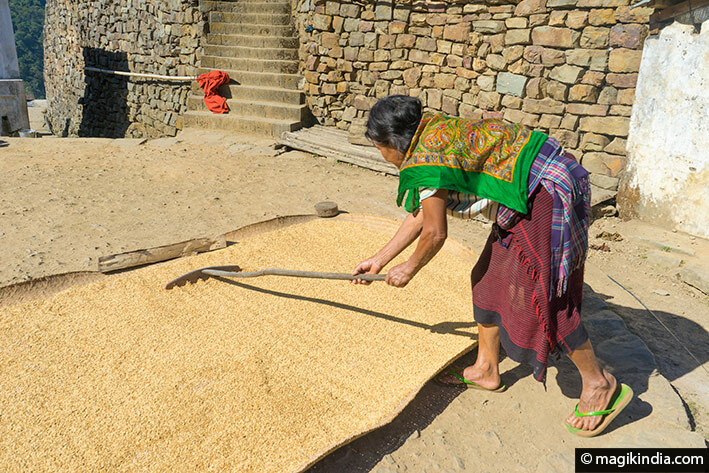 The beer is made from round rice, crushed with a mallet. The rice is then boiled in a cauldron. The mixture is removed from the fire and left to cool overnight. Yeast is added and the mixture ferments for two days; It is then ready. 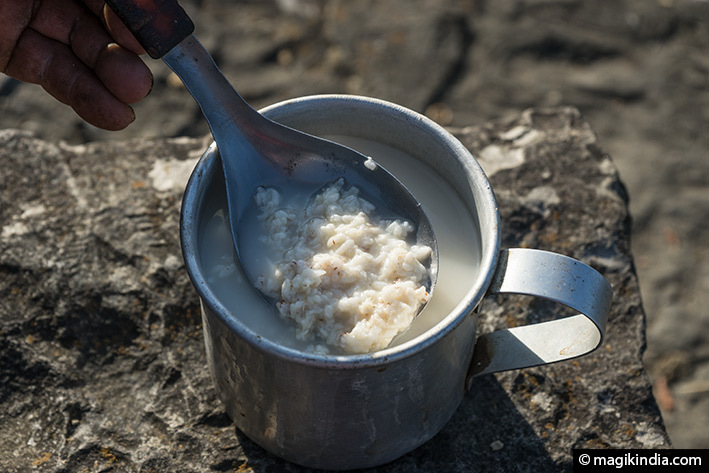 The rice Beer that resembles porridge contains 5% ethanol and is reputed to be a warming and nutritious drink. Sekrenyi (sometimes also called Phousanyi) is the most important festival of the Angamis. It is celebrated for ten days and falls on the twenty-fifth day of the month Kezei (around February 25). The term Sekrenyi literally means ‘festival of sanctification’. The festival follows different rituals, including the “Dzüseva” or purification of men in a well or the ”Thekra Hie ‘’, which lasts for three days and brings together young single men and girls who dance and sing in traditional outfits all day long. They are served meat dishes and rice beer. Khonoma is nestled in lush greenery, in between jungle and rice paddies. Trekking is therefore naturally part of your stay. 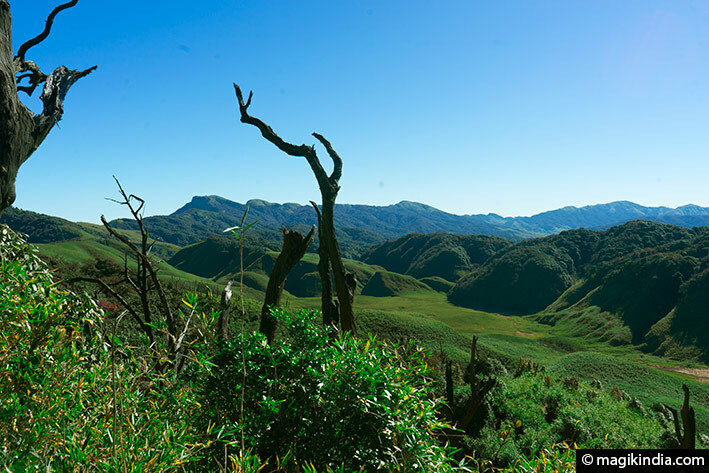 The most beautiful trek around Khonoma is undoubtedly the Dzukou valley. The word dzikou means “like a dream” and we discover why when we reach the valley after about 3 hours of walk. The steep and slippery path suddenly gives way to a magnificent undulating valley planted with dwarf bamboos. The mystical charm and the serenity of this valley are indescribable. 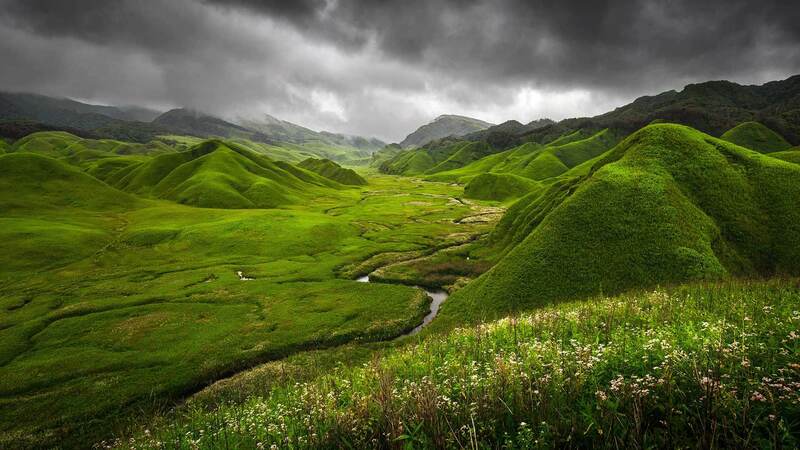 The Dzukou Valley is located at an altitude of 2452 m above sea level, behind the Japfu Peak. Most travelers visit this valley during the months of June to September, when the climatic conditions are favorable for the excursions. In spring, the valley turns into a bed of colorful flowers and shrubs; The pink lilies here grow in abundance adding to the beauty of the place a delicious fragrance.